The English Church is an important part of Zermatt’s history and traditions. It is closely linked to the British visitors who were among the first to want to see and experience the Matterhorn. 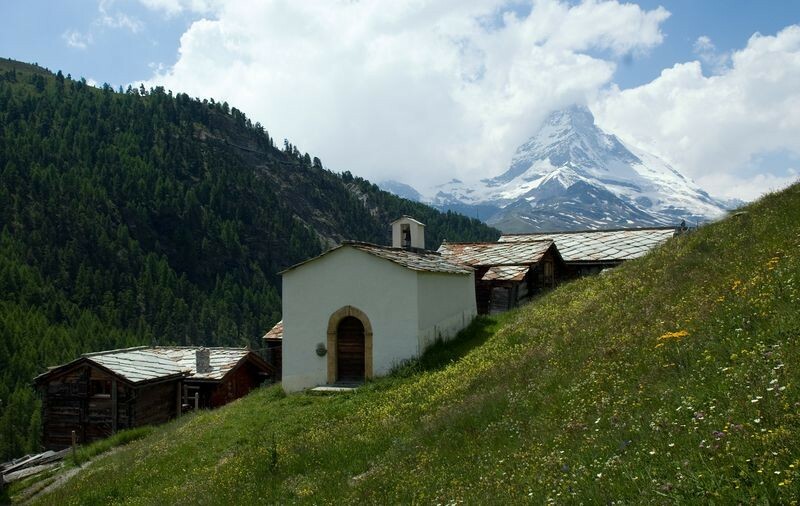 For Zermatt, the English Church occupies an important role in the resort’s history. Consecrated in 1870, the church also represents the “golden age of alpinism”. During the pioneering days of tourism in Zermatt in the 19th century, English guests made up the greatest share of visitors by far. From 1862, Protestant Sunday services for English-speaking guests were held in the Hotel Monte Rosa and the Hotel Mont Cervin. The first plans for the building of an English church were drawn up in May 1865, and a donation list was prepared at the same time. The two hoteliers Alexander Seiler and Joseph Clemenz were the first to add their names to this list, although they were both Catholic: a reflection of their ecumenical and cosmopolitan views. The same year, on 14 July 1865, the British climber Edward Whymper completed the first ascent of the Matterhorn. Of the seven men who reached the summit, only three returned to the village. Four climbers, including Lord Francis Douglas, Douglas R. Hadow and the Reverend Charles Hudson, fell to their deaths on the descent. The tragic end to the first ascent of the Matterhorn did nothing to impede the initiative to build the church, but actually strengthened it even more. The Marquis of Queensberry, head of the family of Lord Francis Douglas, and the relatives of Douglas R. Hadow immediately made large donations. The foundation stone for the English Church was laid on 29 June 1869, only five years after the start of the donation list. The first service took place one year later, on 29 June 1870. 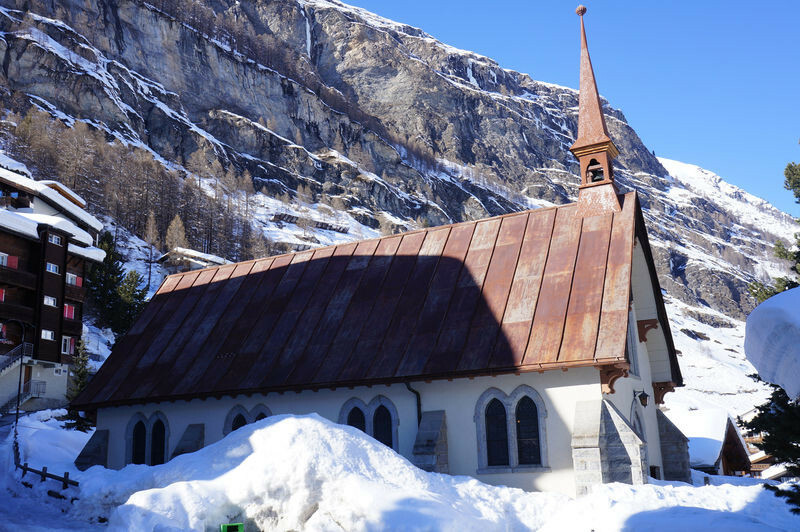 There are numerous plaques inside this historic church in memory of mountaineers who had particularly close links with Zermatt and its mountains. The remains of the Reverend Charles Hudson are buried under the main altar. 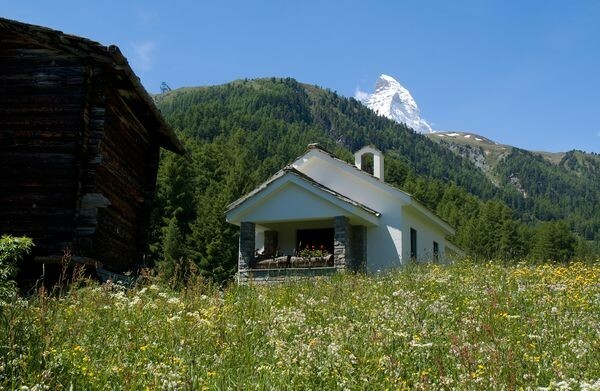 Pastoral care for Protestant guests in Zermatt is provided by the Intercontinental Church Society. The clerics, who originate from England, are changed every two weeks and play an important role to this day. The Alpine Club of Great Britain celebrated its 150th anniversary in Zermatt in 2007. Naturally, a ceremony was held in the English Church. The baroque chapel with recessed choir was built in 1640. The entrance was originally located on the north side, where its outlines are still clearly visible. It was moved to the east side in 1704 and protected with a porch, a massive pillared arcade. When the French overran the village in 1798, the inhabitants of Blatten and Zum See are said to have hidden their modest weapons in the attic of this porch. The interior and exterior of the church were renovated in 1983, and the red paintwork was applied. Until the 20th century, the faithful continued to make pilgrimages to Blatten in two processions. The so-called “Long Procession”, with vespers not far from the chapel, led via Moos back to the village church. The stone-vaulted chapel is dedicated to Mary, Queen of the Rosary. The small altarpiece from the early baroque period, a one-level retable, shows the Mother of God with a nimbus whose points end in stylised roses. The five angels’ heads correspond to the five laws and the fifteen roses to the secrets of the rosary. The altar is crowned with a simple statue of St Joseph. The original Madonna is missing; it was replaced long ago by a plaster figure. 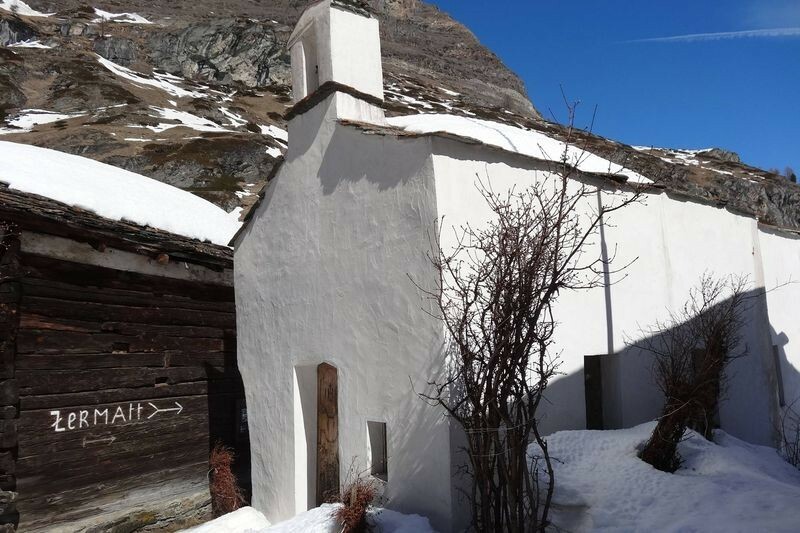 The Zermatt priest Oswald Perren made the chapel a gift of its current Madonna from southern Italy. The Mother of God is carrying the Child Jesus on her arm. A sturdy choir grille protects the altar and the statue from theft and destruction, while the leaded glass windows let sun and light into the room. A simple Stations of the Cross without inscriptions decorates the chapel nave. 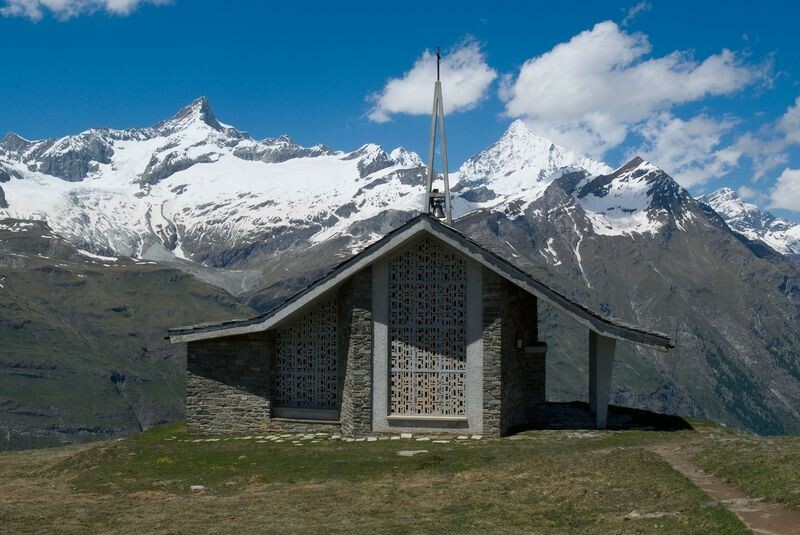 The prayer house of Furi stands on the old mule trail from Zermatt over the Theodul Pass, some way outside the hamlet of Furi at an altitude of about 1,900 m. It was built in 1747 by three brothers from the Furrer family. Their initials stood on the old choir grille: M.M.F., J.F. and P.J.F. It is a small baroque building, not officially a chapel, and normally masses may not be held here. It is dedicated to Our Lady of Sorrows, and the patron’s feast day is on the Friday before Holy Week. An impressive Pietà – Jesus being removed from the Cross – adorns the altar. The nimbus and sword have since disappeared. Part of the old baldachin has been attached to the altar as the antependium (a textile hanging in front of or on the sides of an altar), and the choir is protected by a wrought-iron choir grille. The four beautiful coloured windows by Marion Cartier were given to the chapel during renovation in 1986. They show Mary at the prophesy of Simeon (choir), Mary on the flight into Egypt (nave), Mary meeting Jesus carrying the Cross (right of the doors) and John below the Cross (left of the doors). The ceilings and the doors are new, also from 1986. 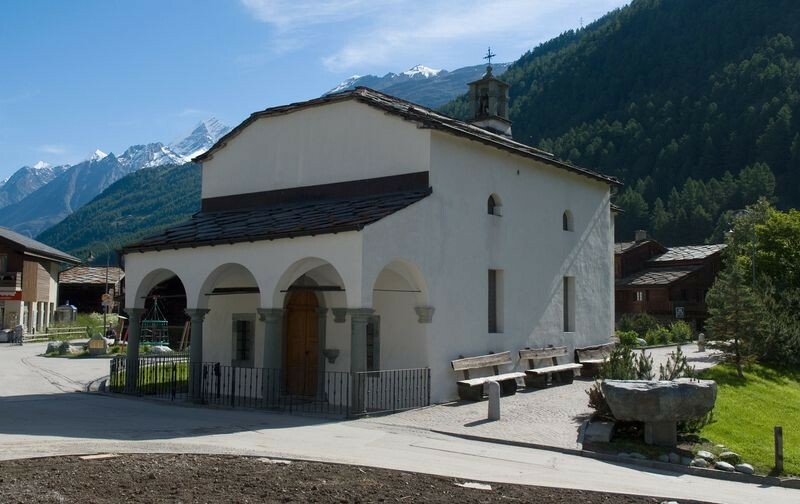 Many inhabitants of Zermatt used to make a pilgrimage to the Mother of God at Furi in order to share their worries and cares with her. After the Kulmhotel Gornergrat opened at the end of the 19th century, Sunday mass was read in the hotel’s dining room during the summer. The bishop expressed the wish for a chapel, and in 1950 construction took place. 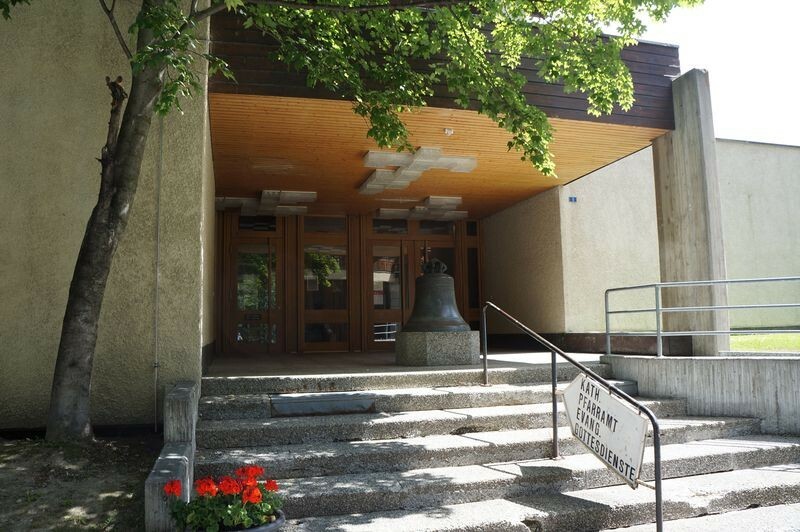 The chapel is owned by the municipality, and stands at an altitude of nearly 3,100 m.
The chapel is a block structure with recessed choir, double-offset roof and bell tower as a roof turret over the entrance. It is dedicated to St Bernard. The exterior surface is rough, grey plasterwork, matching the environment. In fact, the chapel is easily overseen. It lies on the path between the hotel and the mountain railway station. Anyone taking the lift from the latter to the hotel could miss the chapel altogether. The interior has a wooden ceiling and floor of stone slabs. The windows are without stained glass; a confessional box stands on the right of the entrance. The altarpiece consists of relief-style carved wooden figures: in the centre, St Bernard of Aosta; on the left, St Maurice (patron saint of Valais); and on the right, St Theodule. A crown of alpine flowers forms the culmination of the altarpiece. The tabernacle is decorated with grapevines; the altar table is made of stone slabs with a cross. The hamlet of Zmutt lies a short hour’s walk south-west of Zermatt at an altitude of 1,936 m. In the old dialect of Zermatt, a “Mutt” is a rounded summit on a rocky slope. In addition to the “White House” from the year 1595, the hamlet has a rectangular baroque chapel with a recessed choir and a small bell tower over the entrance. 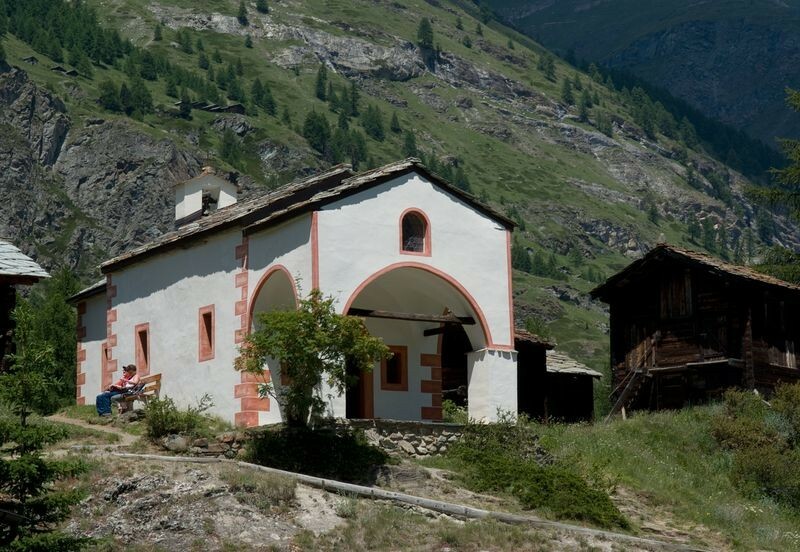 It is dedicated to St Catherine of Alexandria, the second patron saint of Valais, and is a place of calm that the shepherds of the region liked to visit for their prayers. The year 1727 can be seen on the sun-burned entrance doors, and probably indicates the year of construction. The nave with its two windows to the south has a wooden ceiling, while the choir has a type of groined vault made of stone that ends in a circle. The small baroque altar with the chapel saint has been kept simple, the title figure framed by two plain pillars without ornamentation. St Catherine is portrayed with a sword and a broken wheel, because the wheel broke during her execution. She is flanked by two female figures with the palm branch of martyrs. Since the attributes are missing, we can unfortunately no longer say which saints they represent. The pinnacle contains the mater dolorosa. Depictions of the Stations of the Cross hang on the walls of the nave. The inscriptions are in a distinctive form of German; note the unusual style. 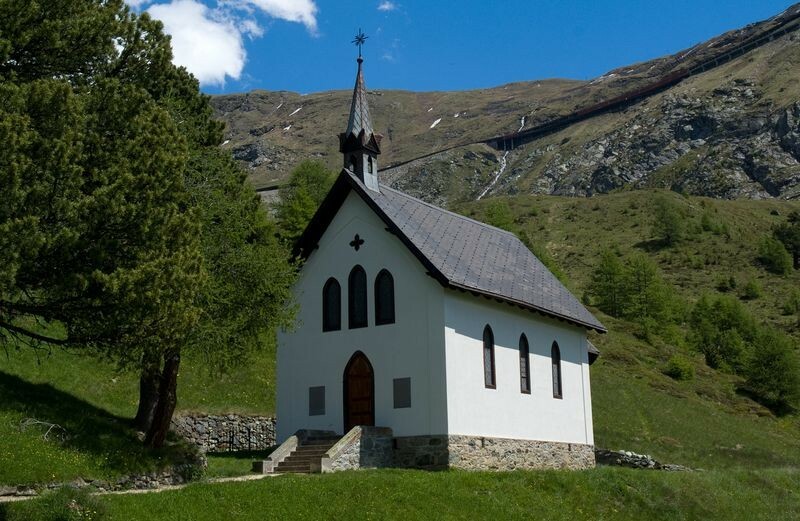 The chapel at Riffelalp was built by Alexander Seiler and his wife Catharine Seiler-Cathrein in 1886, and was dedicated on 3 July 1887. It is still in the private ownership of the Seiler family and is only partly accessible. This rather handsome house of God with its recessed choir, small bell tower and small canopy over the entrance is whitewashed, and is dedicated to the Sacred Heart of Jesus. Two commemorative plaques honouring the founders with dedications in French are attached to the exterior wall left and right of the entrance doors. The chapel has various neo-Gothic features such as the altar, the pointed arched windows and the choir arch. The main figure on the altar, a Sacred Heart of Jesus statue, is flanked by statues of the Mother of God and (presumably) St Rita. Two stained-glass windows showing the Mother of God and St Joseph allow light into the choir. The windows in the nave are made of clear glass. Decorations and commemorative plaques for various members of the Seiler family adorn the walls. The chapel was consecrated in August 1961 by Arthur Elchinger, Bishop of Strasbourg. It is owned by the municipality. The patron saint is St Nicholas of Flüe, also known as Brother Klaus, one of Switzerland’s patron saints. The plans were drawn up by the architect Ferdinand Pfammatter. 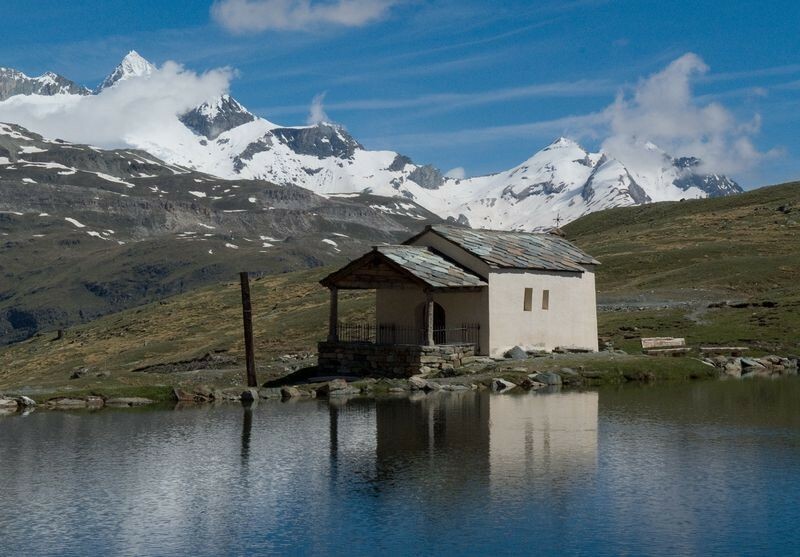 The profile of the building corresponds almost exactly to that of the Weisshorn, the pyramid-shaped 4,000-metre peak on the other side of the valley. The modern building is decidedly different from the baroque chapels in the various hamlets around the village. Natural stone walls are interrupted by glass windows; the roof is extended towards the front and protects the entrance. A small bell hangs in the tower, which is shaped like a pointed triangle. The interior is bright, thanks to the large windows; natural stone walls alternate with wood panelling. A statue of St Nicholas stands on the right-hand side. The altar is made of sandstone, with a wrought-iron tabernacle and the symbols of the Eucharist in enamel and a cross of rock crystal. In 1964, Hans Schäffer, owner of the world-famous gallery in New York, donated a magnificent altarpiece, a painting made in Barcelona around 1400. It is very likely that it was originally part of a winged altarpiece from a Catalan church. It portrays the Mother of God on a rectangular throne with the infant Jesus on her arm. On each side there are four angels singing and playing music. The whole picture is completed with leaf-like ornamental shapes and a Gothic pointed arch. According to legend, a statue of the Mother of God stood at this place even before the “Maria zum Schnee” chapel was built. 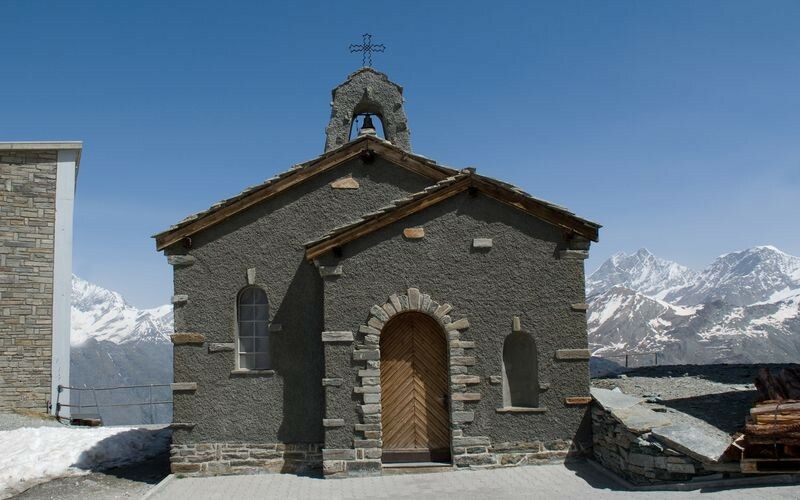 The small chapel goes back to a promise made by two inhabitants of Zermatt who had become hopelessly lost in thick fog on the Theodul Glacier. They were saved, and subsequently erected a prayer house at the location of the wayside shrine. It is thought that the chapel was built in the early-18th century. The chapel, dedicated to “Maria zum Schnee” (Our Lady of the Snows), soon became a popular place of pilgrimage. On the patron saint’s feast day on 5 August, locals and visitors flock to Schwarzsee to celebrate mass in the open air. 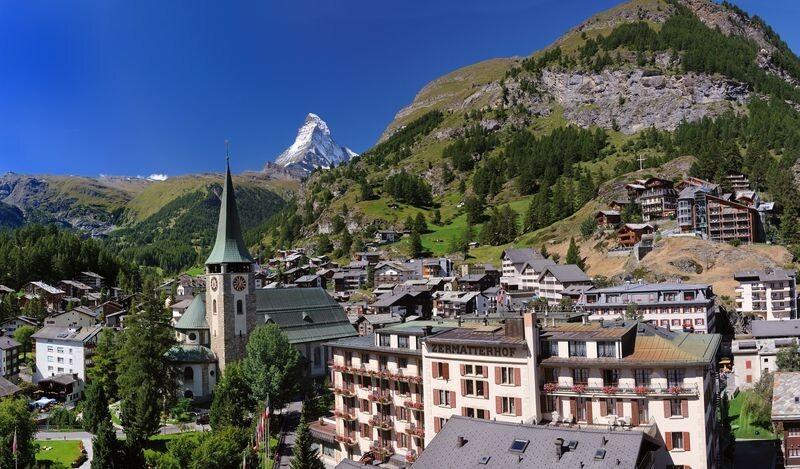 Early documents state that the inhabitants of Zermatt would visit the Mother of God in a procession in early summer to pray for rain in times of drought. Unhappy wives also sought consolation and help in prayer before the image of the Mother of God. Walkers and locals often call in to the small chapel for a moment of peace and to light a candle. The celebrations on the patron saint’s feast day on 5 August are highly popular. The hamlet of Zum See, at about 1,750 m, has been inhabited for around eight months a year since time immemorial, yet it was the only hamlet that had no chapel. Its inhabitants had long wanted to erect a house of God here; in 1962, the residents declared themselves ready to make their assistance and their funds available. 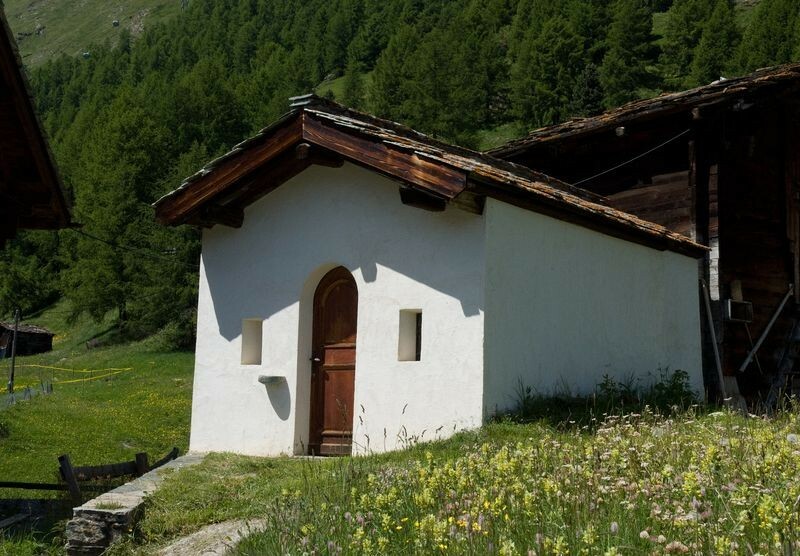 Construction began in 1963; the chapel was consecrated on 5 July 1964, and donated to the parish of Zermatt free of debt by the working group. The chapel is dedicated to St Barbara, said to protect the faithful from storms and sudden death. It is a block structure in the style of chapels from the 17th/18th centuries, with a recessed, somewhat extended choir. The chapel was built to a design by the Basel architect Hermann Dietrich. The stained-glass windows are by the Valais artist Paul Monnier: the Virgin Mary, St Catharine and St Rita are depicted in yellow-red-brown tones on the left side, and St Joseph, St Wendelin and St Augustine in blue-green colours on the right. A simple granite table serves as the altar. A painting of the chapel’s patron saint hangs from the back wall. Two wrought-iron grilles separate the choir from the sacristy behind.